By 2021, cyber attacks are expected to cause $6 trillion in damages worldwide. To combat, spending is predicted to hit $1 trillion between 2017 and 2021. Attackers benefit from an infinite amount of time and tactics at their disposal, as they work to get around the typical static network and endpoint defenses organizations put in place. Deception can complement endpoint and network defenses, adding dynamic security mechanisms that can be customized for every environment to take the attacker’s advantage away. 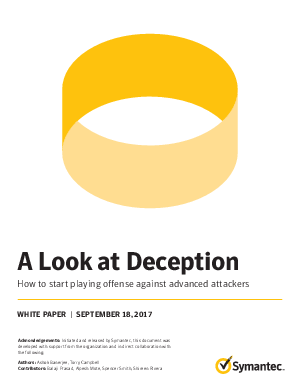 While endpoint and network security protects you from being compromised, deception mitigates the effects of a compromise by detecting it early and identifying the attacker intent which helps coordinate a faster and better response.